There may be a need at some point where POS terminals are either not used during a season or decommissioned indefinitely. In the instance where you would need to remove a terminal, we do not recommend deleting this terminal from AX Retail Headquarters. Below are two easy to implement recommendations for decommissioning POS terminals. To handle this from AX Retail Headquarters, the main recommendation would be to “disable” the profiles for the POS terminal. You can accomplish this by either changing the Store Reference to a dummy store, or the Hardware and Transaction Service Profiles to dummy or no profiles. I would also recommend modifying the Terminal description name to also display a warning such as “Do not use” or “Decommissioned” so that it is known that the terminal does not work without needing to manually configure the profiles. 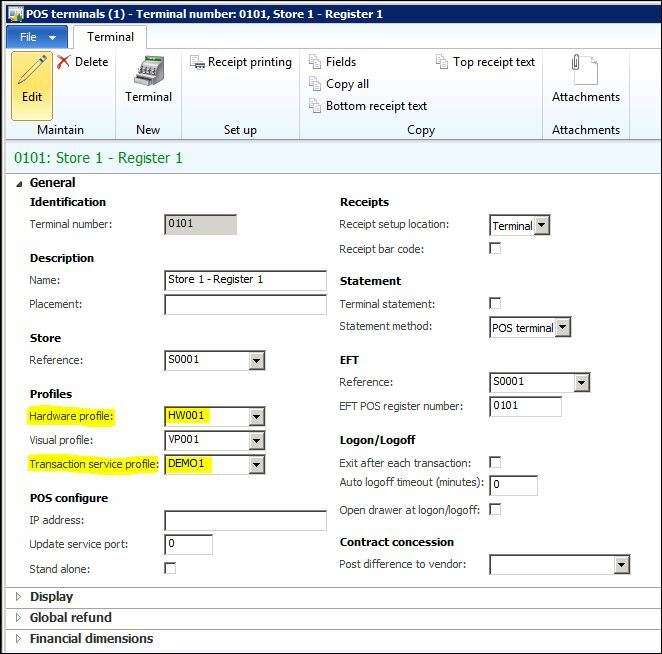 To block the usage of POS at the register if the physical machine still exists, we would take a look at changing the POS.exe.config (C:\Program Files (x86)\Microsoft Dynamics AX\60\Retail POS) file to point to invalid connections. You can blank out or edit the text to make the connections invalid. This way, when POS is launched it will generate a connection error. This gives you with the option to leave the profiles as is in AX Headquarters so that an easy connection can be made if needed from the POS register. You could also hide a valid POS.exe.config file locally to replace the invalid file in the event you need to quickly use the machine. This way you wouldn’t have to remember the proper connection entities or find the person who knows the correct configuration. There are other ways to disable the POS Terminal, but these may be the easiest and the options I’d recommended for taking it offline.